The City of South Bend is investing approximately $50 Million of capital improvements into our shared public spaces through an initiative called My SB Parks & Trails. This includes hundreds of deferred maintenance items, such as replacing old and unsafe playgrounds, benches, athletic courts, and sidewalks. The improvements are designed to make our parks and trails more accessible and involve upgrading our trails and public restrooms to ADA compliance. The suite of projects introduces new features into various parks, leveraging the input and efforts of neighborhood groups, such as those at Fremont and Kelly Parks. We’ve studied and planned investments into areas that have historically been under-served by the system and will be introducing new parks and partnerships to increase access to recreational amenities, including areas on the far east and far south side of town. Through dozens of community planning sessions, we have also embraced several marquee projects such as a new Charles Black Community Center and a newly redeveloped Howard Park. Through all this, we recognize that we still cannot have everything everywhere. There are budget limitations, space constrictions, on-going maintenance considerations, and other simple pragmatic realities that preclude us from having, for example, a stage, a pavilion, or a splash pad in every single park. Concurrently, one of the top requests of our department in a 2018 city-wide survey was to increase programming in our neighborhood parks. This appeal was only behind the frequent request to improve park restrooms, all of which are presently being renovated. We seek to meet the needs of each neighborhood and fulfill the desires of our residents. High quality programming, amenities, and services available in every single neighborhood is our goal. This isn’t just about wants or even necessity. This is a conversation about EQUITY. Just like libraries, museums, and theaters, parks have struggled in recent years to maintain their relevancy. This is particularly true when it comes to appealing to youth. The youngest generations in our society spend nearly 50 hours per week in front of a screen. Factoring in screen-multitasking, that number increases to approximately 70 hours per week of screen time. This leaves very little time for non-screen activities, and among the venues listed above, parks are the least likely to adapt to modern technology. Children are not learning the appeal of a playground, a pickup game in the field, or an afternoon of outdoor discovery. In fact, it is becoming less and less common for parents themselves to have had these memories. Nearly anyone who is a parent of a child 18 or under was raised with a computer and has had a cell phone for their entire adult life. THEIR parents (grandparents of today’s children) were the first to be dubbed helicopter parents. Add all these factors together, and unstructured, outdoor play becomes a thing of yesteryear. There are obviously exceptions, but statistically and culturally, our lives are substantially and more intimately connected to technology than they are to the people around us. We value our screens and social media over shared physical experiences – especially in the outdoors. I previously wrote some additional thoughts on this topic, in a blog called 101 Days of Summer. I don’t want to sit here and write about this as if it were a trend that couldn’t be addressed. After all, I oversee a city department that works with parks and performing arts venues. I am not mad at iPhones or Netflix. I’m not mad at people who use them (the good Lord knows, I use both of those often myself). It’s my job to help people realize the value in off-screen time, but I can’t just try to convince people that they should like time away from their screens. I have to create experiences that they want to like. As such, throughout all of our projects, we seek to pepper our places with surprise and delight. We also realize that we have to meet people where they are at – not only physically, but also technologically. We must be RELEVANT. City officials perform final inspection of Boomer at Spevco. BOOMER was designed by SPEVCO, a custom fabricator of mobile experience vehicles. They’ve done work for huge companies such as Disney, Coca Cola, NFL, and Direct TV. One the most famous mobile experiences in the world is under their care, the Oscar Mayer Wienermobile. SPEVCO was selected after scoring highest in a public, nation-wide Request for Proposals. The firm worked with a cross-functional group of City of South Bend employees for over a year to design and fabricate this $650,000, first-class experience. During the design phase, the South Bend team talked with other cities who have mobile recreation platforms, including Baton Rouge’s Brec on the Geaux and Boise’s Mobile Program. Decisions were also informed by meetings with local cultural, arts, and community-building stakeholders. 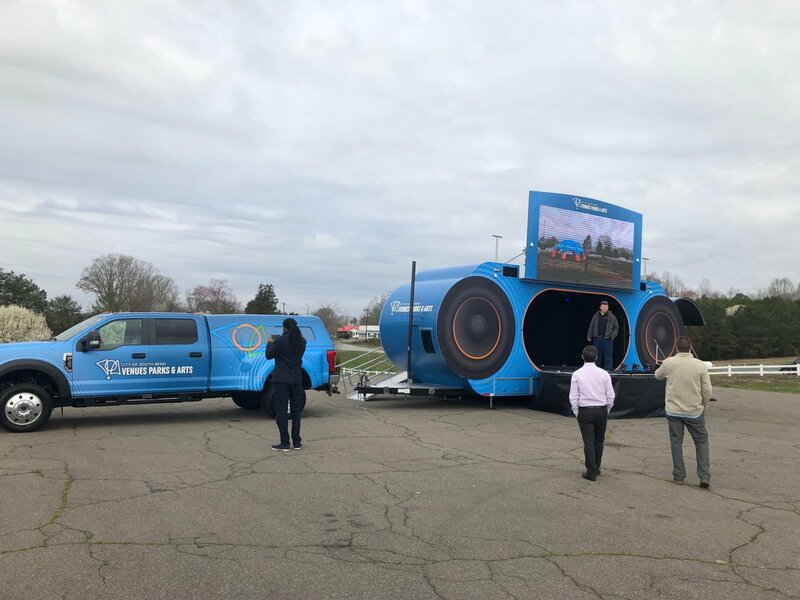 We’ll be able to cross-utilize several portions of the items included with the unit, including the stand-along pickup truck and portable shade structure. Additionally, our team will save money that was previously used to rent video screens, sound systems, and stages. To achieve our mission and elicit the response we desire, BOOMER was designed to a scale that will turn heads. There was no doubt that there was a cost to this investment, but the value Boomer brings to the community made the expense more than worth it. This vehicle was financed through a lease purchase program and was done without seeking additional appropriations or taking from other city resources. We recently paid off other vehicles, re-prioritized staff time, and saw costs savings from a departmental reorganization. Boomer is all paid for by funds that are legislatively designated for parks and recreation programming. Boomer is being made a reality with existing staff and existing financial resources. This is to say, these funds would not have otherwise been spent on potholes, schools, or public safety. Each of these are also important budgetary investments of their own, but they have very different funding sources. This mobile experience is projected to have at least a 10-year life expectancy. To allocate $65,000 per year of existing funds to ensure our parks are more equitable and relevant, seems like a prudent investment. By comparison, a single-site, multi-use playground or a splash pad costs us over $100,000 to install. For all these reasons and more, in October of 2017, the Common Council approved this lease-purchase as part of the 2018 budget process and covered in the South Bend Tribune. This was the result of several public meetings and stakeholder engagement sessions. Our Recreation Division, led by Jonathan Jones, will soon be unveiling the programmatic curriculum and schedule for BOOMER. The route will take it to neighborhood parks across the city – places that haven’t historically seen this type of programming. There are various activation modes, three different nodes for activity on various sides, wi-fi for the park, a sound system, a stage, a roof that can accommodate performers, a giant video screen, and several other “surprise & delight” features. The programming itself will be even more important that the vehicle. Physical fitness, music, arts, healthy eating, social unity… lessons will be brought to life, aiming to impact lives and neighborhoods long after Boomer leaves. For the immediate future, this mobile experience will be exclusively focused on our mission-related activity. Many stakeholders have already inquired about the ability to have BOOMER show up at existing community functions or events. Others have even asked about renting the asset. We’re excited that this has such broad appeal (and nobody has even seen it in person yet)! Nonetheless, we want to remain true to our goal of having this be a special tool, delivering EQUITY and RELEVANCE to our neighborhood parks. If you’re excited about experiencing BOOMER, come visit your neighborhood park – he’ll be there soon! 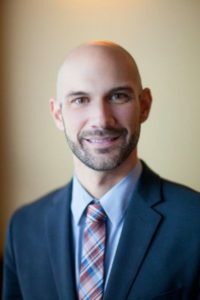 Aaron Perri is Executive Director of Venues Parks & Arts, a department within the City of South Bend that works to create exceptional experiences and opportunities. Its efforts focus in the areas of health and recreation, parks and conservation, arts and culture, and visitor attraction. Perri, a South Bend native, is a graduate of John Adams High School and earned both a bachelor’s degree and MBA from the University of Notre Dame. Perri recently served as chair of SB 150, the city’s year-long, community-wide sesquicentennial celebration. He also spearheaded the creation of South Bend River Lights – from inception to installation. Formerly, Perri was the executive director of Downtown South Bend, Inc., a non-profit established in 2002 to boost the growth of downtown South Bend. Previous to that he served as general manager of Legends of Notre Dame, overseeing the catering, banquet, and live entertainment facility. Perri is active in many local boards, is a sought after speaker & consultant, and has received state and nation-wide recognition for his community development efforts. It's time to get the kids out of the house and shake off that deep winter hibernation! Venues Parks & Arts staff members give you five things they're looking forward to this fall and winter.